If I had to put a single name forward as the first Impressionist, it would have to be Charles-François Daubigny, who was born two centuries ago, on 15 February 1817, in Paris. To celebrate his bicentenary – the first bicentenary of any of the French Impressionists – I offer a brief review of his career and a small selection of his wonderful landscape paintings, in this article and its sequel. His father was also a landscape painter. Daubigny seems to have been a sickly child, and to promote his health was sent for several years to stay in the village of Valmondois, to the north of Paris, on the river Oise, in the care of a nurse/nanny. To set his age in context, he was a schoolboy of 13 when the oldest of the mainstream Impressionists, Pissarro, was born, and had started work at the age of 15 when Édouard Manet was born. 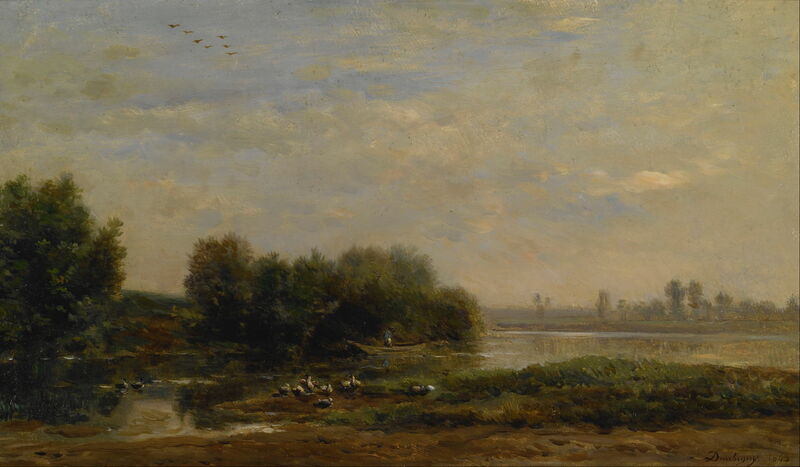 By 1834, Daubigny was helping to restore paintings in the Louvre, although he still enjoyed returning to the countryside on the banks of the Oise. The following year, he started as a student in the studio of Pierre-Asthasie-Théodore Sentiès. In 1836, he had earned enough money to pay for himself to travel to Rome and southern Italy, with a colleague from the studio. On his return the following year, he entered the Prix de Rome, but was unsuccessful. Daubigny continued to develop his paintings, and in 1838 had his first landscape accepted by the Salon. This was followed by two landscapes in 1840, when he had started in Paul Delaroche’s studio. Unfortunately there was a misunderstanding over the rules of the Prix de Rome in 1841, and his submission was eliminated; he abandoned further attempts. He continued to exhibit at the Salon through the 1840s, and married at the end of 1842. The following year he started painting in the Forest of Fontainebleau, which was the focal point for the Barbizon School at the time. At some stage during the 1840s, he met and befriended Camille Corot – a friendship which was to last until Corot’s death in 1875. With the liberalisation of the Salon under the Republic in 1848, Daubigny exhibited six paintings, and won a second class medal. The Harvest (1851) and View from the Banks of the Seine at Bezons (1851) were great successes at the Salon in 1852, and were bought by the Nation, although they were also criticised for their sketch-like finish. Daubigny’s use of colour in this painting heralded the changes that came with the main Impressionist movement. 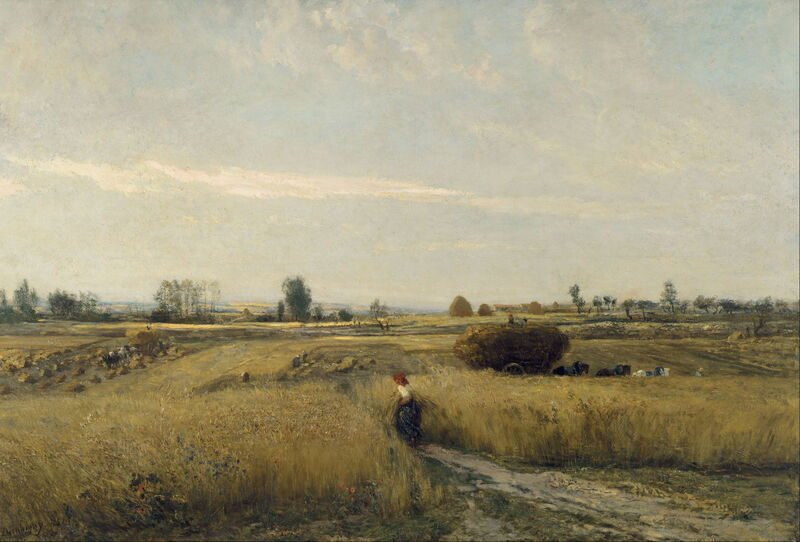 Charles-François Daubigny (1817–1878), The Hamlet of Optevoz (c 1852), oil on canvas, 57.8 × 92.7 cm, Metropolitan Museum of Art, New York, NY. Wikimedia Commons. Daubigny painted with Corot in Switzerland, and in The Hamlet of Optevoz (c 1852). 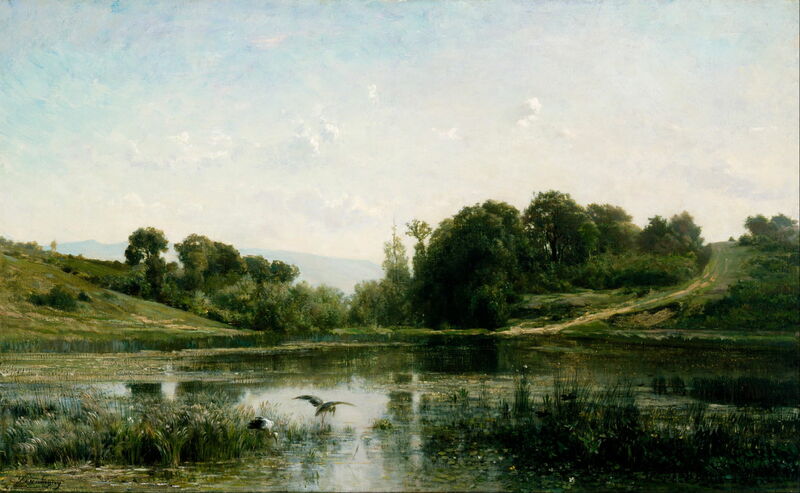 The Pond at Gylieu (1853) was his great success of the Salon of 1853: it won a gold medal, and was purchased by Emperor Napoleon III. I think that it is one of his greatest masterpieces, and one of the finest realist landscapes of the century. The detail below may help convince you. 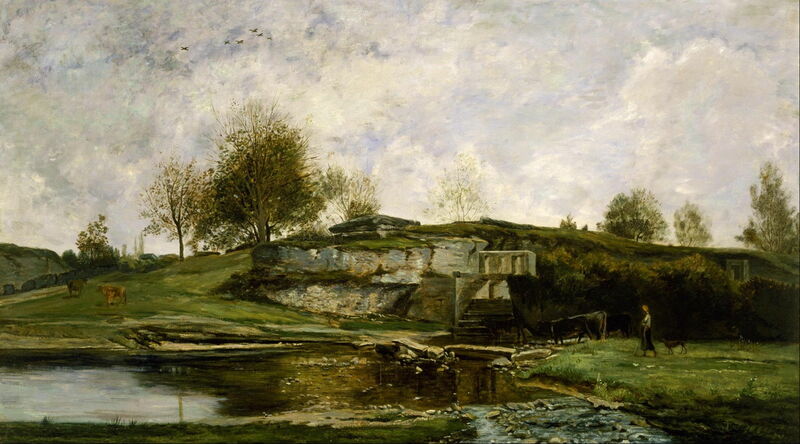 Charles-François Daubigny (1817–1878), Sluice in the Optevoz Valley (1854), oil on canvas, 160.7 x 90.2 cm, Museum of Fine Arts, Houston, TX. Wikimedia Commons. 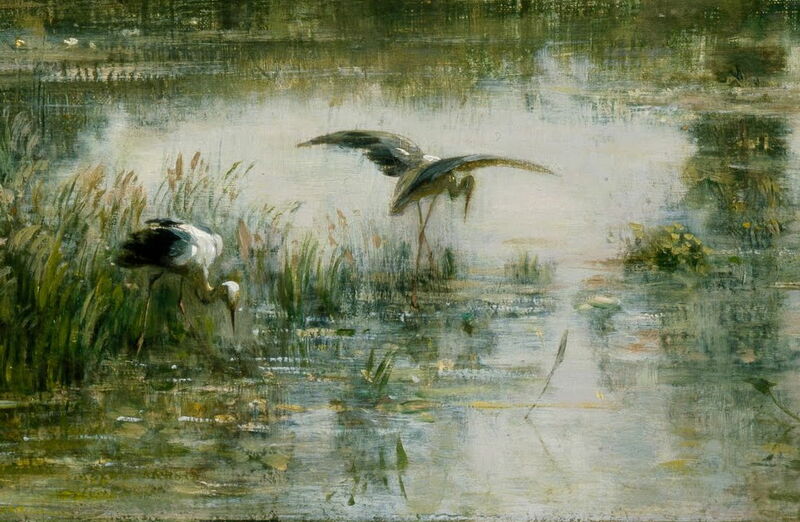 In the mid 1850s, he started to paint extensively on the coast of Normandy and Brittany. 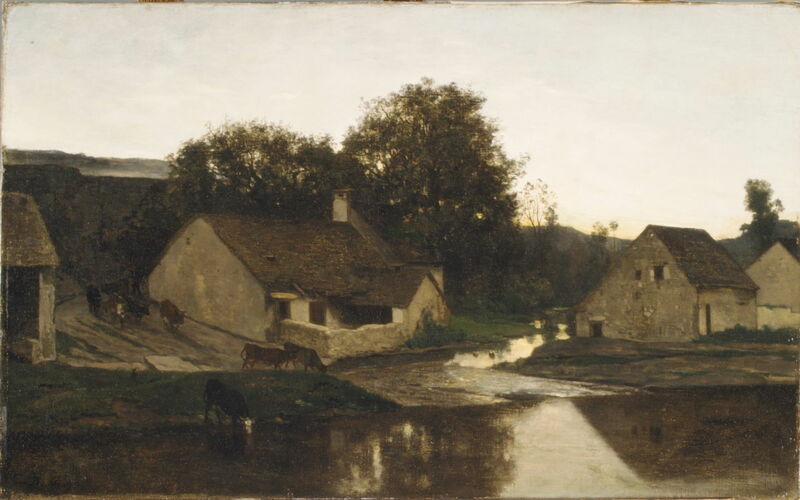 He returned to Optevoz to paint Sluice in the Optevoz Valley (1854), which won him a third class medal at the Exposition Universelle in Paris in 1855; this painting was also purchased by the State. 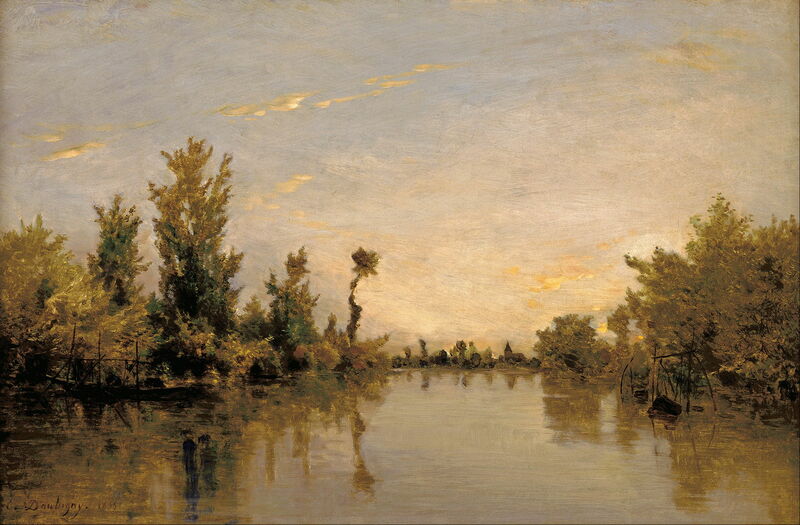 Banks of the Seine (1855) marked the start of a long campaign painting the banks of rivers in northern France. To facilitate that, in 1857 he launched a specially-built studio boat, anticipating Monet’s later use of a similar floating studio. He also turned to fruit trees in blossom in the spring, and his first major painting of them, Spring (1857), was acclaimed for its originality. He was made a Chevalier of the Legion of Honour in 1859 – the year that Monet ‘discovered’ his work, and Pissarro first exhibited in the Salon. In 1860 and 1861, Daubigny visited Gustave Courbet, in his home town of Ornans. 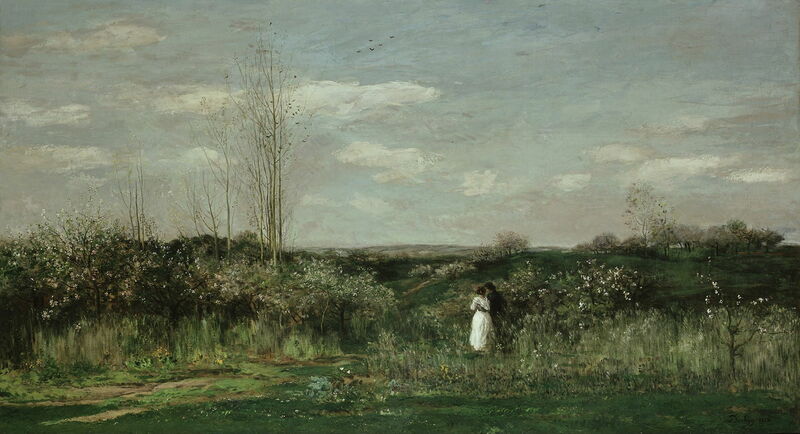 Charles-François Daubigny (1817–1878), Spring Landscape (1862), oil on canvas, 133 x 240 cm, Alte Nationalgalerie, Berlin. Wikimedia Commons. This rather later painting of blossom, Spring Landscape (1862), was made in the same year that Daubigny moved into a new purpose-built house and studio in Auvers-sur-Oise. This marked the beginning of the artists’ colony there, where Vincent van Gogh was later to spend his final two months of painting. On the Oise (1863) is a fine example of the paintings that Daubigny made of riverbanks at this time, and shows the influence that they had on the mainstream Impressionists over the following decades. In 1863 he entertained Berthe Morisot and her family, and he continued to have social contact and to encourage her painting. Posted in General, Painting and tagged Barbizon, Corot, Courbet, Daubigny, Impressionism, landscape, Manet, Monet, Morisot, painting, Pissarro. Bookmark the permalink. Thanks for his article about Charles-François Daubigny, my ancestor . Besides the talented man who had indeed started to paint differently, on the spot, and also from his boat Studio, the Botin, from 1857, he has spent a fair amount of his energy promoting arts and new comers like Monet, Pissaro and many others, who became very famous. Yes, without his devoted and sustained support to the younger Impressionists, I wonder if the movement would ever have succeeded in the way that it did. He was a good and very loyal friend to many of them.